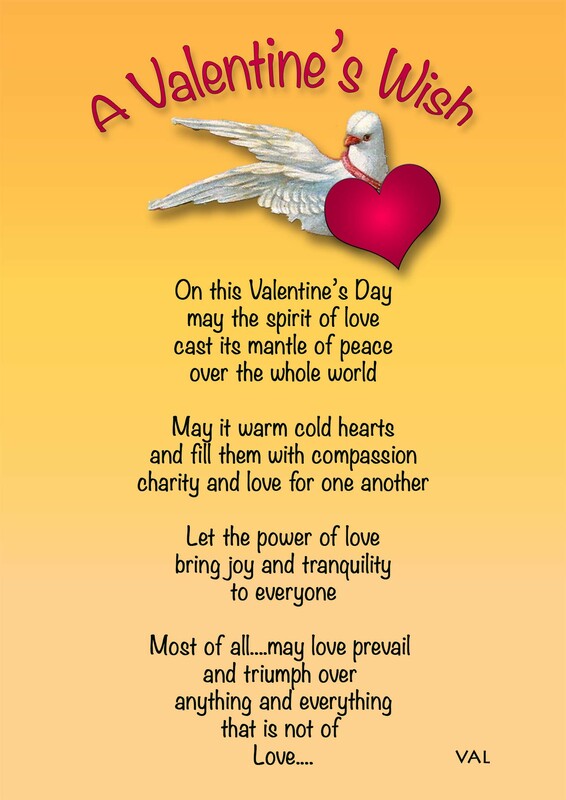 If love makes the world go around – our wish for this Valentine’s Day is for LOVE to spread far and wide to make the world a better place for everyone…. Wishing one and all a blessed and happy day filled with joy, peace and love. 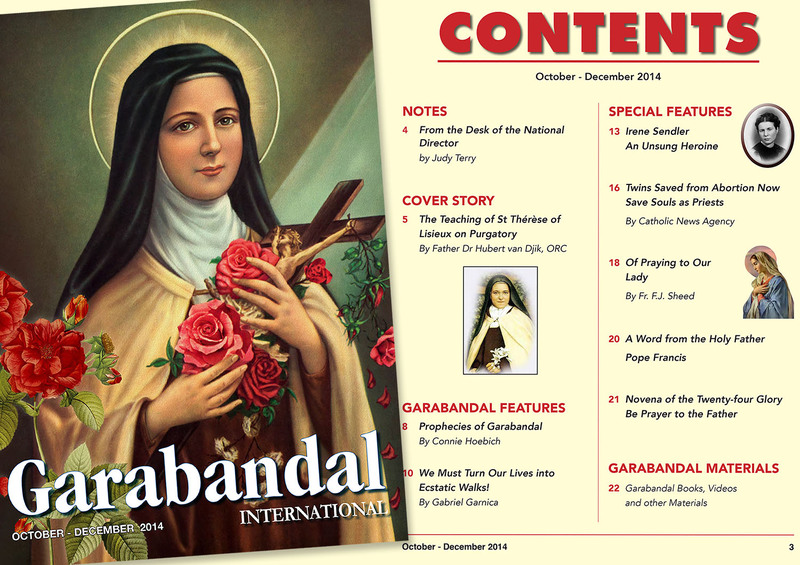 The Garabandal International Magazine for October till December 2014 is now online for your reading pleasure. Just click here to access it. Wishing one and all a wonderful and blessed day! Birds and flowers are drawn by Suzanne. 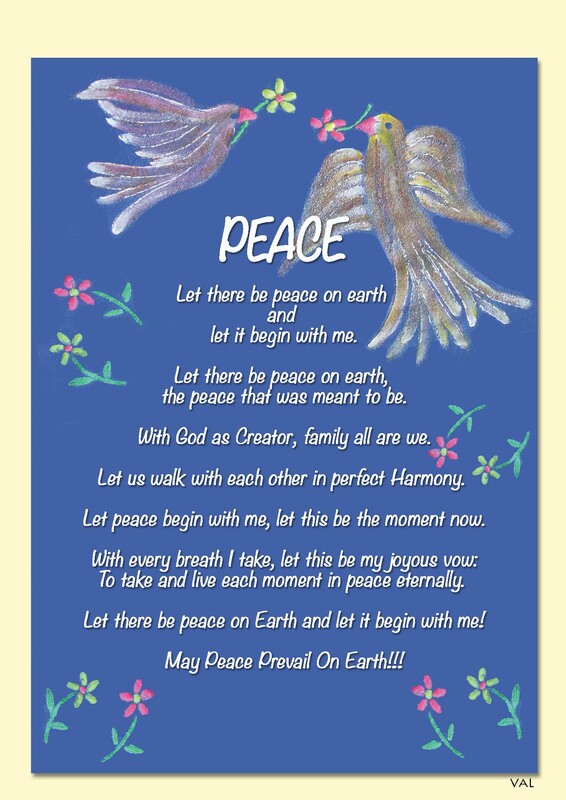 More so today than ever before, we need Peace in every aspect of our lives and in the world. As the quote (from this link – please click here) above says, the world will be a better place if everyone starts with themselves and spreads the ripples of Peace far and wide. Almighty God, We bless you for our lives, we give you praise for your abundant mercy and grace we receive. We thank you for your faithfulness even though we are not that faithful to you. Lord Jesus, we ask you to give us all around peace in our mind, body, soul and spirit. We want you to heal and remove everything that is causing stress, grief, and sorrow in our lives. Let your angels of peace go ahead of us when we go out and stay by our side when we return. A few months ago, we were nominated for the LIEBSTER AWARD by McCrazy Daily Lessons! Thank you so much, Heather (Princess!) It was a very pleasant surprise and we are truly excited about being nominated for this award. So, what is a Liebster? The meaning: Liebster is German and means sweetest, kindest, nicest, dearest, beloved, lovely, kind, pleasant, valued, cute, endearing, and welcome. The Liebster Award is given to up and coming bloggers who have less than 200 followers. 1. Thank the blogger who nominated you for the Liebster Award, and link back to his or her blog. 3. Post 11 random facts about yourself. 4. Nominate 11 bloggers of your own, with under 200 followers, whom you think are as awesome as you. 6. And finally… Display the Liebster Award logo on your page. 5. Dreams? – at our age, many of our dreams have been achieved, but we always have a new one to look forward to – it would be nice to be able to meet the new Pope Francis in person. 6. Fears? – we believe the good Lord is looking after us and feel safe in this knowledge. 7. Do you like to travel? – yes of course. 8. Favorite Sport? – my wife loves to watch F1 while I enjoy tennis, badminton and football matches. 2. Suzanne enjoys Japanese cuisine but I prefer local Malaysian fare. 3. Our family and friends are all important, but #1 is our faith in God. 4. Suzanne loves watching Chinese soap operas on tv. 5. At 91, I am probably the ‘most mature’ computer enthusiast in town. 6. Mary loves to cook and she is truly good at it! 7. Suzanne is never idle and keeps busy with creative projects. 8. Suzanne is a keep fit enthusiast. 10. We are always thankful for daily blessings. 11. We believe in learning something new every day. 3. What is your favourite type of cuisine? 4. What nationality are you? 5. Do you enjoy any sport? 8. Where in the world would you like to visit next? 9. What languages do you speak? 10.What is your dream car? 11. Who is your ‘hero’? Thank You once again, McCrazy Daily Lessons!! 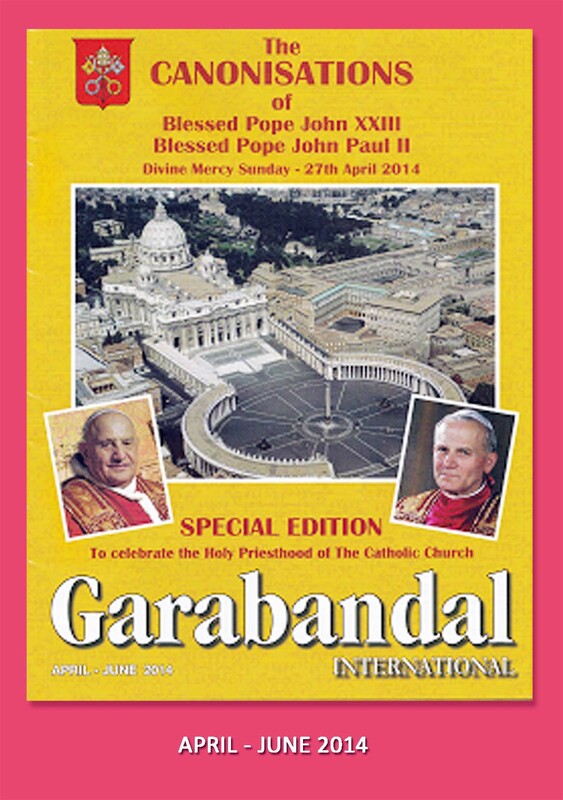 The APRIL – JUNE issue of Garabandal International Magazine is available for online reading – please click here. We are pleased to share the testimony of a friend, Elizabeth, who eloquently describes her beautiful experience during the hour of Adoration following Holy Thursday mass. This Holy Thursday, 17th April 2014, I was intent on spending one hour in adoration instead of the hurried minutes I had spent in all the previous years. The ambience after mass was perfect when the lights were dimmed in the Church of Divine Mercy, Penang and the solemn voice of our parish priest, Father Martin came through, inviting all present to spend one hour with the Lord. I didn’t really know what to do or say so I started with praise and thanksgiving for all the blessings I had received. To my dismay, that took me less than 5 minutes and I wondered what I was supposed to do with the remaining 55 minutes! Then I remembered what I had learnt at the recent Oremus Catholic prayer program, so I invited Jesus to take over because I didn’t know what to do next. I closed my eyes in the stillness of the church and suddenly, a laughing Jesus was sitting in front of me holding both my hands! I had never imagined Jesus in that light before. He took me through all the good moments in my life, some forgotten, some very impossible dreams I have had and how it was ALL realized. I had come to believe that these achievements were due to my efforts. As He gazed at me, I saw His hand in every happy moment of my life. I felt so loved and I was amazed that I was so important to Him. It was as if the one purpose in His life was to make me happy. We were both laughing as we recalled the good times. I glanced at my watch – half an hour had gone by and I didn’t want this feel good moment to go. Then he started to take me to the moments that were not so happy. I flinched, blocking out that phase. The only sorrow I allowed Him to show me was the death of my mother at a young age. Like a loving father, He did not force the other sad moments on me. He then asked me a strange question – ‘Why can’t you be your true self instead of mirroring the behavior of those around you?’ I did not understand this, so I asked Him to teach and guide me to be the person that He wanted me to be. Jesus than asked me another question using these exact words, “Will you carry my light for all to see?” I was almost groaning up to the point he said ‘carry’ because I had always associated ‘carry’ with the cross and I really wasn’t prepared to do anything difficult. I don’t remember replying to His request because I was focused on the cross. Soon it was time for Him to go to Gethsemane. I asked His permission to spend the hour of prayer with Him and He said “Yes”. What happened next is beyond my wildest imagination. There is no way that I could have forced this scene on my own without the stroke of the Master story-teller Himself. At the end of that hour, I realized that I was no longer in that particular spot with Him. Instead I found myself with a group of people outside. I saw myself pointing Jesus out to them. At that horrendous moment, I realized that it wasn’t Judas but I who had betrayed Him in the garden of Gethsemane! 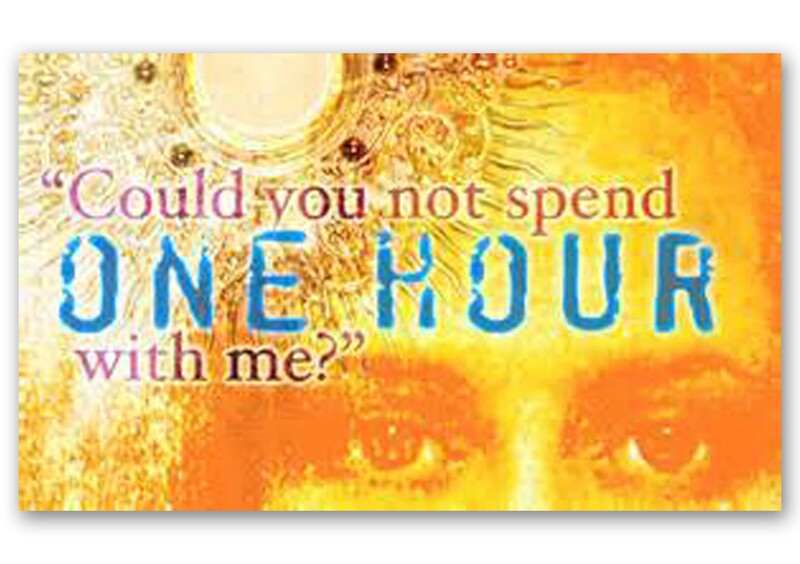 My heart was beating fast and I realized that my one hour of adoration was up. I quickly went out of the church as I felt I had to speak to Father Martin or someone about what had happened to me. He was with my sister and a few others who were all intrigued with the newly renovated grotto. I convinced myself that they would think I was a fanatical fruitcake, so I joined them in admiring the new waterfall and pond. Looking back, this behavior had what prompted Jesus to ask the very first question He had put to me! When I returned home, I kept playing the experience in my mind and then promptly fell asleep. The next morning as I was praying, the scene kept flashing again. I quickly jotted it down, lest I forget or distort any part of it. I was still in state of heightened awareness of my experience. I shared it with my children, but the words didn’t quite come out the way I wanted it to as I had difficulty controlling my emotions and my tears. I promised myself that I would write it out and share it with others, but a little voice kept creeping in trying to convince me that not only will they be skeptical but they will also think that I had a vivid imagination and nothing else. I fought this conflicting urges for 12 days. Today, Tuesday, the 29th April I received an unexpected phone call from a woman I have never met or talked to. For over 2 years, I have been helping people write testimonies for the Chapel of Immaculate Conception in Sungai Batu. I wanted badly to write the powerful story of healing of Diane’s daughter. We had communicated via SMS for appointments to meet or talk over the phone but it kept on being postponed. Diane was taken aback, so I related to her what I had experienced on Holy Thursday. After getting a direct hit from the Lord himself, I sat down and wrote out this testimony so that ‘it can give light to everyone’. God bless. Hello everyone, it has been a whirlwind of activities whizzing us through the last few months, and in Malaysia we are still in the midst of the 15-day observation of the Lunar New Year. On this note, we take the opportunity to wish one and all a blessed New Year! With the good Lord watching over us, we are deeply grateful for all the blessings showered on our family and friends in 2013. We continue to pray for peace in the world and for God’s guidance in all we do, through the year ahead. If you have not already read the online version of the quarterly issue of the Garabandal International magazine, please click here for the January-March 2014 issue.